Getting your lawn ready for the winter is a crucial part of maintaining its health. However, working on the lawn when the temperature has dropped can be a daunting task. Leave all the work to us! After all, we’ve dealt with Alberta weather for over 25 years. 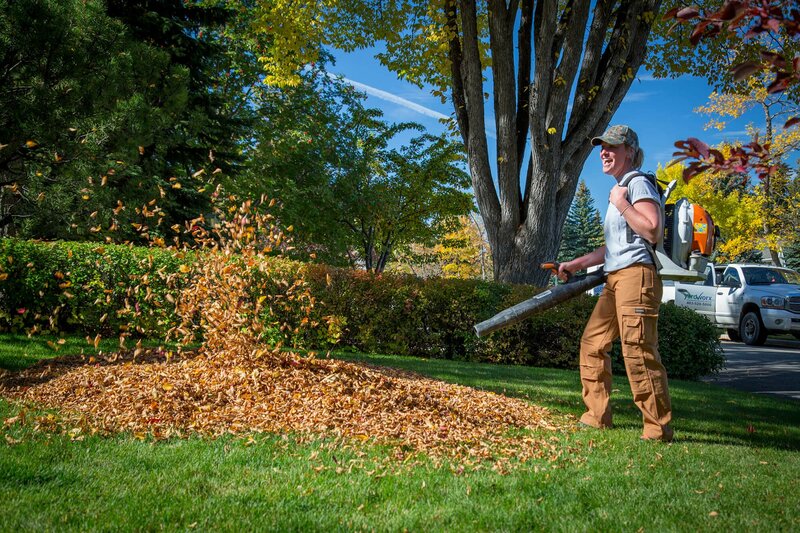 Our Fall Clean Up Calgary and Edmonton services include leaf raking, debris cleaning, and fall core aeration services. Our fall lawn maintenance crew will rake all the leaves and clean debris off of the entire property. Then they will blow out all the beds and hedges and clean up the entire property. The lawn will then be cut and trimmed one final time to leave a clean & tidy yard. Grassroots must have air (oxygen) to be healthy. When soils become compacted there is little room for air or water to be present. Under ideal conditions, the soil should be composed of 50% solids, 25% air and 25% water. Core aeration removes several plugs per foot to allow air and water to enter the soil, resulting in a compaction-reducing swelling of the soil. Aeration can benefit every lawn, but your lawn’s health will benefit most if any of the following conditions are present: heavy clay soils, weeds, excessive runoff and puddling, sparse thin lawns. Newly sodded lawns, especially peat sods can be aerated as soon as they are well rooted: (8-10 weeks). Lawns can be aerated anytime there is adequate moisture, but the best times to aerate are in the late spring and early fall. The crew will aerate the entire lawn area with a machine, walking back and forth in a similar pattern to mowing the lawn. It pulls small 1 ½ inch – 2 inch plugs of soil out every few inches and deposits them on the surface of the lawn. This is where the plugs will be left to break down. The crew will then blow off all of the debris on the sidewalk.